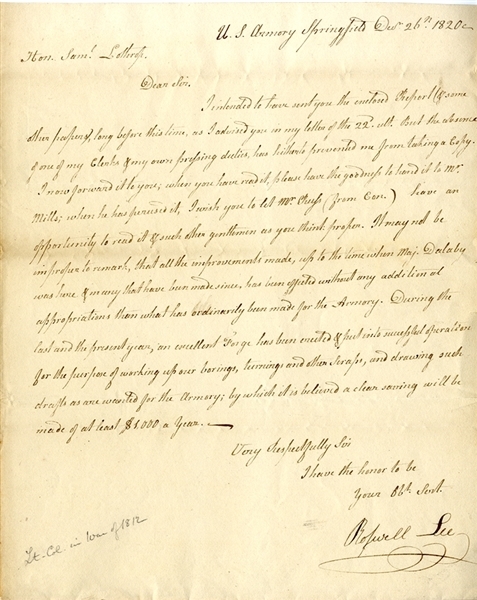 Manuscript Letter Signed “Roswell Lee” 1pp. quarto, U.S. Armory Springfield, December 20, 1820, addressed to Hon. Saml. Lothrop, and reads in part: “...During the last and present year, an excellent forge has been erecteed & put into successful operation for the purpose of working up our borings, turnings and other seraps, and drawing such drafts as are wanted for the Armory; by which it is believed a clear saving will be made of at least $1,000 a year....” Fine condition. The Springfield Armory, located in the city of Springfield, Massachusetts, was the primary center for the manufacture of United States military firearms from 1777 until its closing in 1968, it was one of the first factories in the United States dedicated to the manufacture of weapons. The site is preserved as the Springfield Armory National Historic Site, Western Massachusetts' only unit of the national park system. It features the world's largest collection of historic American firearms.